Helix is a genus of large air-breathing land snails, terrestrial pulmonate gastropod molluscs. The genus Helix is known from the Oligocene onwards. This genus is native to Europe and the regions around the Mediterranean Sea. 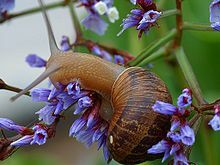 The best-known species include Helix aspersa, the common, or brown garden snail, and Helix pomatia, the Roman snail, Burgundy snail, or edible snail. H. pomatia and some other species are eaten as escargots. Helix snails have been introduced throughout the world, where some, especially H. aspersa, have become garden pests. Snails in this genus create and use love darts during mating. Helix snails prefer cool, damp environments, as they easily get dry. Snails are most active at night and after rainfall. During unfavourable conditions, a snail will remain inside its shell, usually under rocks or other hiding places, to avoid being discovered by predators. In dry climates snails will naturally congregate near water sources, including artificial sources such as waste-water outlets of air conditioners. The common garden snail (Helix aspersa) is herbivorous. These snails are able to digest most vegetation including carrots and lettuce. They also have a specialized crop of symbiotic bacteria that help their digestion, especially by breaking down the polysaccharide cellulose into simple sugars. ↑ 'Pulmonate' means they have a sort of lung, instead of gills. This page was last changed on 28 January 2015, at 05:58.